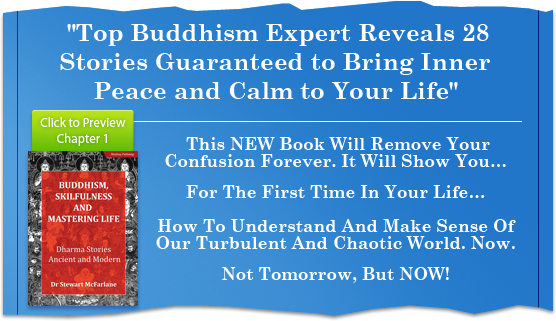 IF YOU REALLY WANT TO UNDERSTAND LIFE’S MYSTERIES, learn the value of a meditative and spiritual perspective on life, or want to achieve peace of mind, body and spirit… then this could be the most important page you’ll read all year! In today’s hectic and chaotic world, understanding and coping with everything that is thrown at us can mean the difference between stress, worry and anxiety – or a life of contentment and peace! My name is Dr. Stewart McFarlane and I’m an expert in T’ai Chi, Asian Studies and Buddhism. I’ve researched, taught and lectured on these subjects in Universities around the world for most of my life. 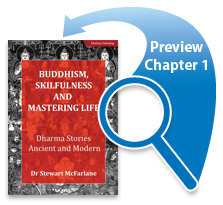 My latest book – “Buddhism, Skillfulness and Mastering Life: Dharma Stories Ancient and Modern” – is going to reveal everything you need to fully understand the seemingly chaotic modern world around you – and your place in it – through ancient Buddhist teachings. HERE’S THE IMPORTANT POINT: in Buddhist culture, storytelling has been the primary method of teaching Buddhism concepts throughout its history. Stories – more than any other medium – are easier to remember, paint a more vivid picture in the mind’s-eye and are more effective for rediscovering their hidden messages. Messages that are needed even more with today’s lifestyle! I know this to be true, as I experienced a lot of soul-searching and confusion until I discovered the simple and profound lessons in the ancient stories handed down through Buddhist culture. These stories and fables influenced my life so much – and gave me the insights I needed to thrive – that I decided to gather together 28 of the most meaningful stories into my latest 113 page book. Imagine how you’ll feel when your friends and family notice the new and calmer you! You’ll make rapid progress in understanding the mindset you need to enhance your sense of wellbeing, contentment and harmony. I’m so convinced of the effectiveness and benefits this book will bring to your life, I have no hesitation in saying every minute you wait, you’re denying yourself complete harmony of mind, body and spirit. You get a downloadable ebook in PDF format that can be read on any ebook reader. You get 28 stories that convey the central teachings of Buddhism and how to put them to work in your own life. Each story comes with my own thoughts and interpretation, so you can use the underlying concepts in all areas of your life. If “Buddhism, Skillfulness and Mastering Life: Dharma Stories Ancient and Modern” doesn’t show you exactly how to really understand what’s going on around you… or if it fails to help you increase your peace of mind, body and spirit, then you’ll receive a full refund, No Questions Asked!! As you can see, I’ll the risk is squarely on my shoulders, so…. Go ahead and click the order link now and you’ll be on your way to enjoying all the benefits we’ve talked about here and more! You’ll be taken to our totally secure order processing system, where you can order your copy of “Buddhism, Skillfulness and Mastering Life: Dharma Stories Ancient and Modern” in complete safety. “Buddhism, Skillfulness and Mastering Life: Dharma Stories Ancient and Modern” is the key to identifying what those beliefs are… and giving you many ways to make powerful and intelligent decisions. P.S. This really is a defining moment in your life. You can now see what’s been holding you back – and more importantly – how “Buddhism, Skillfulness and Mastering Life: Dharma Stories Ancient and Modern” will move you forward. So be bold and grasp this with both hands!